​The energy of Vietnam is invigorating and infectious. Whether navigating the hustling Ho Chi Minh City by moped or the spectacular Halong Bay by boat, cruising the backwaters of the Mekong Delta or strolling the backalleys of Hoi An, you will find the people, scenery, sights and tastes of Vietnam an experience to treasure. Some international carriers now fly directly to Saigon and Ho Chi Minh, and these centres can also be easily reached from the nearby hub of Bangkok. There is generally a range of facilities and amenities to suit most budgets except in the more remote parts of the country. The cuisine is renowned, for good reason, and the people are welcoming and friendly with English spoken in the main centres. Travel throughout the country is easy with a good network of trains and buses. Weather wise, there is not really a right or wrong time to visit Vietnam as during most months of the year you will experience both sunshine and rain in varying quantities. Average temperatures vary significantly from north to south and it is advisable to check regional climate trends before travelling. 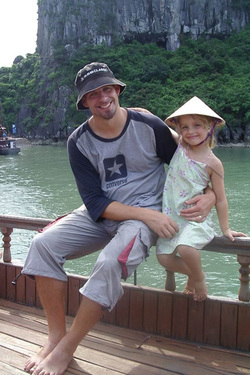 We visited Vietnam in 2008 with our children aged 4 and 7, their grandparents aged in their 60s and two friends aged in their 50s. ​Click on the sample itinerary below to view a suggested family tour for this destination. This is based on our own travels but can be amended to suit differing ages, group sizes and duration. For those short on time, domestic flights can be taken instead of the longer bus or train journeys. Acc​urate travel times, accommodation and guide details will be provided once your personalised itinerary is confirmed.